Sincerely invite you to play our Game _ Alien Cheater _ has been released in the App Store. itch.io Community » Game Development » Release Announcements · Created a new topic Alien Cheater - "Don't want to be the only one on your phone,but please have a place for me." A1982 is one of the messengers of Quinbani Planet sent to the planet for aggression task. Quill is a supervisor that responsible for monitoring the progress of the task and ensuring that the act of aggression can proceed smoothly. Can you help them conquer the Earth or go to the next planet? Alien Cheater is a simulation game, players as the helper, helping aliens A1982 and Quill successfully conquer the Earth. In the game, the player can get hundreds of kinds of replication robots, and through the robot to earn money, upgrade own city, in order to get more money to carry out events, let the whole Earth surrender to you. Hundreds of kinds of replication robots, head and body to play the creative mix. - Want to be a tramp or an office worker? - The child's body with the adult's head, or more with the funny method, waiting for you to discover. - Not limited to people, but also animal options. Upgrade your own city to attract more Earthlings. - From ruins to industrial estates. - From slums to bustling cities. - From the desert to the snow. - How many cities can you hold on to? Easy to get started and let you really enjoy the fun of playing game. - You just have to click on the robot to get money. - If you don't want to keep clicking, enjoy the joyful of someone give you money when you turn on the App. - Don't forget to go into “Special Action mode" and get a lot of money in a short time. We are an indie team - Immortal Game design Studio, consisting of three people. 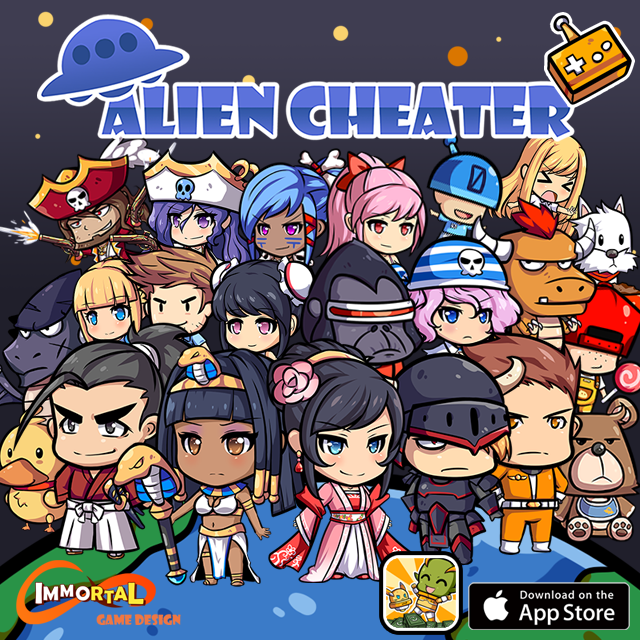 Our Game _ Alien Cheater _ has been released in the App Store. This is the first time we've released a game. If you have any suggestions about the content of the game, can let us know at any time.